Nothing quite compares to the good nights sleep you will experience by having the right type of pillow that is suited tor you. Pillows come in different densities – soft, medium or hard or variations of the one or more of these. So it all comes down to personal preference and taking into account any back or neck problems you may be experiencing. Some people like soft billowy and others prefer a more solid type of pillow. Whatever your taste you are sure to find the right type for you here online. 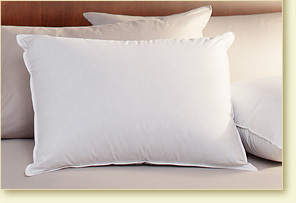 Pillows are available with synthetic or natural fiber filling. There are a variety of pillows filled with goose or duck down, dacron, feather core, natural latex foam, cotton and various blends. There are many different shapes and sizes of pillows available such as round pillows, square pillows, rectangular pillows, wedge shaped pillows, body pillows and pregnancy pillows. Each of these shapes serves a purpose and are designed to help you get a good nights rest. The full body maternity pillow supports your back and tummy while you sleep. Maybe you are redoing the kids bedroom and want a bedding set that all matches, or perhaps you just want a convenient way for your children to take extra bedding to grandma’s for the holidays or the kids are having their friends over for a sleepover, whatever the reason you simply can’t go past the convenience of a bed in a bag. Everything in a bed in a bag pack has a co-ordinated look and you can pack everything into the bag so that it is easy to carry. You will find that a Bed in Bag comes in a wide variety of designs, styles and colors. Why not get a bed in a bag in your child’s favorite team colors or maybe you have a toddler who loves Nemo or the Disney Princesses in which case you will find that a Disney Bed in a Bag is ideal for their room. Where Can I Buy a Bed in a Bag for my kids? My sister came to visit on xmas day with her new baby. He is an absolutely gorgeous little boy, of course. She brought a portable round crib with her, so that Alex would have somewhere familiar to sleep when it came time for him to have a nap. 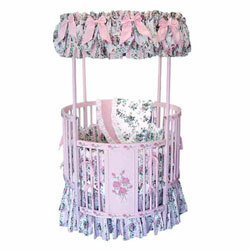 bumpers, sheets and comforter sets to fit round cribs. Mandy has a round baby crib bedding set with Pooh Bear and friends. But there are designs and styles to suit any nursery decor. There are a number in of new mothers in her ‘mothers group’ who have opted to buy round cribs for their nursery’s. Apart from the fantastic range of sheets and comforters you can also buy a Round Crib Waterproof Mattress Protector which will ensure that your baby’s mattress is protected. The quilted mattress protector is completely waterproof and will protect the mattress while adding a little more comfort for your little one. Where Can I Buy Round Crib Baby Bedding And Mattress Protectors? Once upon a time, not so very long ago, buying bed sheets was a simple process. This is no longer the case, buying bed sheets has become a major project when you take into account the amount of information available concerning thread count, percale, piman, Egyptian Cotton. What does it all mean to someone who just wants to update their bedding? Understanding how your linens are made from and how they are made will give you the means to know what exactly you are getting for your money. I will talk about each of the different types of bedding over the next few posts. The majority of bed linens are made from Egyptian cotton, pima or supima, sateens, polycotton blends and cotton with the very best quality you can buy being Egyptian Cotton. So, we now know that the best quality cotton comes from the banks of the Nile River in Egypt. Linen made from Egyptian cotton is considered to be the most luxurious and durable with a lovely silky feel and lustre to the finished product. The quality is on account of the extra long fibers used to create Egyptian cotton. Expected thread count is from 200-300. Of course not all Egyptian cotton is the same and like everything else it can vary in grades, fiber length, ply (the number of threads twisted together) and the weave. The manner in which the sheeting is manufactured can also vary greatly. Thread count also contributes to the quality of bed linen. This refers to the number of vertical and horizontal threads contained in a one inch square of fabric. This is determined by the ply and thickness of the thread used. Egyptian cotton is fine and so it has more threads per square inch than other cottons. Because the finer threads are more fragile, you will find that quality Egyptian cotton is twisted into a two ply thread. This also ensures that the twisted fibers are better able to resist pilling. Thread count is not the only thing that contributes to quality linen, Percale, which is often mistaken for a blend of cotton and polyester, also plays a vital part. Percale is the weave not the material content. So it is the combination of the closely woven percale weave and the high thread count that results in the soft luxurious feel of quality sheets. 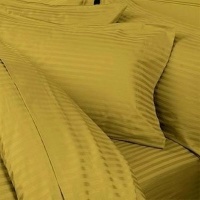 I have recently purchasedd 1000 thread count Egyptian sheets and believe me it is like sleeping on a cloud. However, I have been told that after a thread count on 400 the only difference is the price. I have to say that I beg to differ. I definitely notice the difference in the luxurious feel of my Egyptian cotton sheets to the lesser thread count linen I have. Where Can I Buy Egyptian Cotton Bed Sheets? One of the things the we know about sheets is that the higher the thread count the softer the weave. For a wonderful sleep experience try sheets with 1000 Thread Count , before you know it you will be drifting off into dreamworld because of the sheer comfort. To make sure that you experience the a comfortable nights sleep the minimum thread count you should consider for comfort and durability is 250. But it’s not only thread counts that’s important, something else you need to check is the ply. It is quite common nowadays for short lengths of cheap thread to be woven together, this gives a high thread count but the threads are thicker giving the resulting fabric an inferior quality. So always remember to check that it’s a single ply along with the thread count. Where Can I Buy Sheets With High Thread Counts? Sinking down into a warm, soft waterbed at night is an unparalleled luxury for many people. But before you go out to buy a new bed, you should have a good overview of the choices you will face. Here are some tips on how to choose a waterbed, to ensure that you spend your hard-earned money on a bed that will feel great for years to come. As with any kind of mattress, deciding the size you want is the first step in picking a waterbed. Water mattresses come in a full range of bedding sizes, from twin to king. You can also choose an unusual shape, such as a round mattress, to give your bedroom a unique look. Some people enjoy the gentle rocking motion of water beneath them, while others find it very distracting, especially if it is a spouse or significant other whose motions are sending waves through the bed. Luckily you have three choices to determine the level of motion in your water mattress: waveless, semi-waveless, and full motion. The original waterbed design included a hard wooden frame which held the inner water mattress inside of it, as well as a plastic liner to catch leaks. The hard frame sometimes made it difficult to get out of the waterbed, and could be unpleasant if hit unintentionally with a hand or knee. More modern soft frames alleviate this problem while allowing waterbeds to be used with any bed frame. Some soft frames are designed to hold long water-filled tubes instead of one single water mattress, which reduces waves and increases support. Some waterbeds allow adjustment on each side, so that each partner can have the support and firmness that best appeals to him or her. If you and your partner disagree on the perfect firmness for a bed, then this is the type of mattress for you. Does the very thought of azure blue waters, warm white sands, and lush tropical flowers make you feel more relaxed? Do you wish that you could escape from your everyday life and spend more time sipping outrageously colored drinks under the warm equatorial sun? Even if you can’t spend as much time on vacation as you would like, you can still bring the relaxed atmosphere and wild beauty of the ocean and jungle in your own home, with this tropical themed bedding or other colorful tropical bedding . Bedding that captures the unique beauty of the tropics is far different from the more standard pastel florals that are found in many comforter designs. 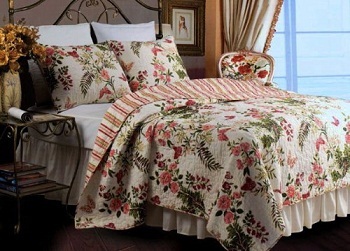 Imagine a bright orangey-red comforter accented by pillows boasting green palm leaves and red hibiscus flowers. 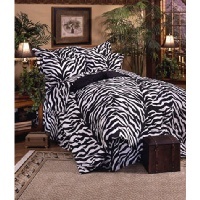 Top off the look with a striped bed ruffle that picks up the greens, reds, and khakis of your jungle theme. If the ocean calls to you more strongly than the jungle does, you can pair a dreamy turquoise blue comforter with decorative pillows that reflect the colors of sand and sun. A pillow shaped like a beach ball will round out the look while adding a fun flair to your room decor. Are you dreaming of a trip to Hawaii? Pair a raffia grass bed skirt with a coral-colored comforter and seashell-shaped cushions, and say “aloha” every time you walk into your bedroom. To enhance the tropical feel in your bedroom, select furniture and accents made of beautiful rattan, bamboo, or wicker. Paired with striking bedding, wicker furnishings will make you feel like you are ready to step out onto the beach, even in the dead of winter. While you probably can’t whisk yourself away to the tropics every time you need a break from the everyday, you can create an oasis of comfort and serenity in your home with the bedding and furniture choices that you make. With just a touch of creativity, you can bring the tropics home with you. We have just completely revitalized our website with a new template and a new blog. We felt it was time for a change as our old site was beginning to look a bit dated, stale and tired. We hope you love the new look. We will be bringing you lots of hints, tips, sale coupons and other snippets to help you choose the right bedding for you and your family.